An ecolonomic lifestyle is when you are economical and also environmentally friendly. It ties economy and ecology into your lifestyle. Practicing ecolonomics in daily life is simple. 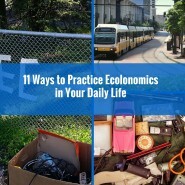 Below are 11 ways to practice ecolonomics. Is there any old furniture lying about in your house? How about your garage, attic or basement? Now is the time to clean everything out, repair your old stuff, reuse what you can and recycle what you don’t need. 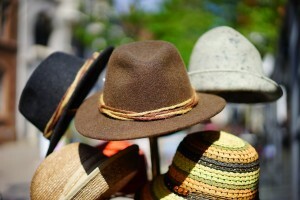 Maybe you have old clothes, an old bicycle or a lawn mower that can be fixed and reused. You just bought a new lawnmower or don’t want to ride your old bike? If you don’t want to use them, donate your old stuff to a non-profit organization. Again check your garage, attic and basement. Get rid of all your old stuff that can be recycled and reused. If you have old electronics, gadgets or maybe old cloths that you don’t use any more, maybe you can host a yard sale and sell them to your neighbors. It gives you an opportunity to hang out with your neighbors and make a little bit of extra cash as well. The less you use your vehicle, the better it is for the environment. Try carpooling or riding the bus to work once in awhile. When you buy anything, check for the origin of the product. Buying local products reduces the amount of fossil fuels burned for transportation, storage and distribution. Buy your groceries from a local farmer. You may find a farmer’s market near you or a neighbor growing foods at home. Buying locally grown organic foods is healthy and also environmentally friendly. It also helps your local community. A front yard flower garden would instantly make your home look and feel gorgeous. If you don’t have a front yard, plant indoors or on your balcony. Plants help us in many different ways; they purify air and also help you reduce stress. Like organic foods? Why not start your own home-based farm? If you have a big enough backyard for a garden and a pond, you could start a fish farm or an integrated farming system where you grow plants and raise fish at the same time. You can also find indoor tower gardens if you don’t have a big backyard. Adding solar panels and wind turbines to your power grid could ease off some load from the electric company. If you power your own house with alternative power sources, it would reduce the pressure on fossil fuels. Use eco-friendly products, minimize wastage, preserve and protect the environment. Turn off lights when you leave the room, unplug electrical gadgets when turned off, and conserve resources like water and gas, whenever possible. Seal and insulate your house, use energy efficient light bulbs and appliances, and replace your old ones. Replace old shower head with an economical one, so that less water is wasted every time you take a shower. If you need something, look for a greener alternative. If you are hanging gutters, try to find gutters made with recycled aluminum. If you are cleaning your house, use natural eco-friendly cleaning products that do not contain harsh toxic chemicals. If you are buying groceries, look for organic products, avoid excessive packaging, and buy local. There are so many greener alternatives available today that all you need is to make the right choice. To practice ecolonomics is a choice. We don’t have unlimited resources, and if we don’t use our resources wisely, soon we’ll be facing shortages. Try reusing, repairing and recycling what you already have, and when you buy new products, make sure that they are environmentally friendly. All it takes is a little bit of awareness and the right choices. Hope you’ll implement these tips in your everyday life and become more ecolonomic. For more information, please read our blogs regularly. To get in touch, please call: 303-495-3705 or email us: ioe@ecolomics.org. You may also find us on Facebook or Click Here to Book a Meeting with Us. P.S: Want to catch us live? Checkout our next ecolonomics in action Live Blab!